Kakha Bendukidze died in November 2014 at the age of 58. Bendukidze directed the whirlwind of economic reform that characterised Georgia from 2004 to 2008-9. 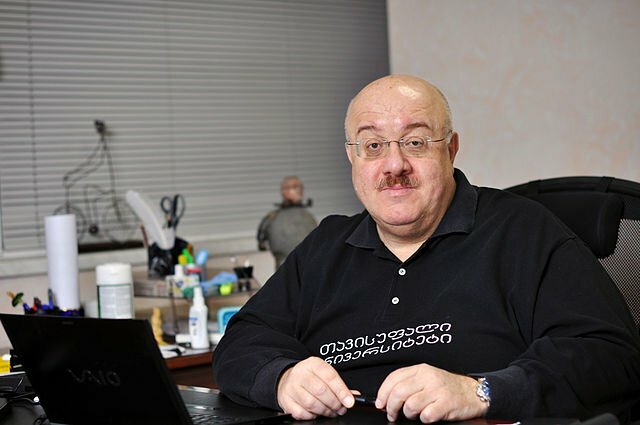 One of the most successful Georgian entrepreneurs working in Russia, Kakha Bendukidze saw an opportunity in the great sell-off of Russian state assets in the 1990s. He returned to Georgia in 2004, and initially led the Georgian Ministry of the Economy. Bendukidze became the Rose Revolution’s ideological dynamo and its most visible libertarian. After his retirement from politics in 2009, Bendukidze devoted his money and time to reforming higher education through the creation of modern, independent universities such as the Free University of Tbilisi and the Agricultural University of Georgia. From 2004-2008, Bendukidze was at the eye of the storm as Minister for the Coordination of Economic Reforms. He famously declared he would sell everything but Georgia’s conscience. His goal, he said, was to close down his own ministry, and to demolish all economic regulation by the state. Bendukidze was the inspiration behind a stunning reform of the tax system, including the reduction of 21 taxes to 6 in 2005, and the introduction of a 12% flat tax. He rapidly privatised state holdings, and opened up the Georgian economy to global markets and unhindered foreign investment. For Bendukidze and his western fans, Georgia was a laboratory of economic reform. It was where the superiority of neo-liberal strategies would be proven. Bendukidze compared Georgia to Singapore and Hong Kong, and saw the Rose Revolution as the paragon of global entrepreneurship in its most miraculous form. He famously declared he would sell everything but Georgia’s conscience. During Bendukidze’s time in office, Georgia — most visibly its urban centres in Tbilisi and Batumi — was a pulsating building site, accompanied, until 2007-2008, by figures of fabulous GDP growth, and ecstatic praise from the World Bank (in 2009, Georgia was in 15th place in the World Bank’s Ease of Doing Business Survey). Trade, exports, and the budget expanded, and FDI [foreign direct investment] reached record highs. By 2010, 77% of the workforce was employed in the private sector, and the only large commercial assets left in state hands were railways and gas pipelines. But in retrospect, all this activity was more of a social transformation than an economic one, and the 'mental revolution', which was to accompany it, has still not come to Georgia. Bendukidze’s legacy, despite a dramatic break with the stagnant and corrupt Georgian economy of the 1990s, was illusory, based more on utopian aspirations than realistic calculations. Instead, Bendukidze was what Karl Popper called a 'utopian engineer.' His policies were polarising and ineffective for the majority of the population, and in the end, hindered democratic growth. They were illusory because of unrealistic goals (the elimination of poverty), deceptive rhetoric, and the way in which the Georgian government, as well as western economists, measured 'progress'.Their definition ignored the symbiotic relationship between economic and political life; and in the end, politics triumphed over economics. Financial data in Bendukidze's Georgia was politicised: neither GDP nor GNP measured the cash economy, nor the unregistered remittances on which most Georgians depended. Just 30% of the working population received salaries. Given only 20% of these were in the private sector, aggregate data on salaries and private industry were misleading when described as 'national' trends. Aggregate unemployment and poverty rates told us nothing about their depth, or the wide regional and age-based variations. Employment figures neither reflected reality (rural farmers were categorised as self-employed) or income levels; many of Georgia’s ‘employed’ remained below the poverty line (officially 38%). The devotion of Bendukidze and his colleagues to an economic programme, which neglected the needs of ordinary Georgians, led to a fantasy world, a form of political schizophrenia similar to the one that eventually sundered the USSR. The government was blind to policy failures, and deaf to resistance and complaint. Facades and fantasies clashed with realities and revolts. Georgian government leaders were undermined by their own isolation and conviction, which in 2007 led to popular revolt, a constitutional crisis, and in the summer of 2008, contributed to the war with Russia. The Rose Revolutionaries were genuinely surprised by their humiliating defeat in the 2012 elections. Utopianism was explicit in the government’s goal of rapid social and economic transformation. President Saakashvili and Kakha Bendukidze, like Yegor Gaidar and the Russian reformers before them, were spurred on by Western governments to reach their goal as soon as possible. But the speed generated mistakes and created resistance. It highlighted a larger problem that all utopians encounter: how to transform established societal and economic norms, and generate respect for new rules. Alan Greenspan, Chair of the US Federal Reserve, declared in a 1997 speech that 'much of what we took for granted in our free market system and assumed to be human nature, was not nature at all, but culture.' His comment underlined the perseverance, despite ambitious economic change, of informality and resistance to rules brought in from the outside. The failure of Georgia’s economic transformation illustrated the degree of symbolism in Bendukidze’s programme of economic liberty. In underdeveloped Georgia, with its long tradition of popular resistance to ignorant state administrators, it was more of an aesthetic vision than a realistic one. This is a common pattern in the post-colonial world where Western countries push universal economic blueprints with little calculation of the ability of locals to undo them. It might have seemed paradoxical that the carriers of the neo-liberal torch in Georgia indulged in a systematic process of state intrusion, intimidating domestic businesses to raise revenue, and manipulating media ownership to augment their influence. But such interventionism is a logical outcome of libertarian economics in a political and business environment unconstrained by traditions of legal compliance. Deregulation in these conditions — as Georgia showed —encourages businesses to seek influence with customary sources of power in state structures and among state officials. The premise behind western democratisation in post-communist states is that economic liberalisation is necessary, even if it increases inequalities. That may be true, but it is not any old ‘market’ that leads to democracy, it is one that promotes business independence, the rule of law, and a degree of economic power for ordinary citizens. Bendukidze’s policies ultimately failed in all three respects, and this contributed to the Georgian government’s authoritarian cover-up. Political guile is almost always a short-term remedy for long-term needs. Standfirst image via Wikipedia. Some rights reserved.